Looking for affordable, quality accommodations for your next vacation? Take a look at Our Conesus Lake House! 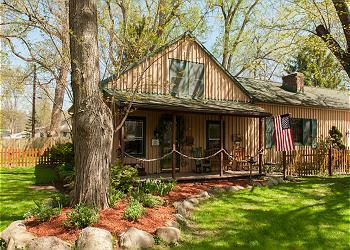 This adorable lake access cottage offers most of the comforts of home, a private boat dock, and community swimming beach, and is within a 5 minute drive from Livonia. From the driveway you enter the home onto the main living floor. To the right is an open dining area with seating for six. To the left is a small sitting area, that leads directly to the kitchen. Bar seating for two at the end of the kitchen is perfect for a quiet coffee break, or to keep conversation going with the family chef. Modern appliances, and a window over the sink overlooking the back yard completes the picture. A full bath with shower and separate bathtub is just off the entryway. Stepping up from the dining area into the living room, where overstuffed leather furniture, a fireplace, and flat screen cable TV will make your indoor time just as relaxing as the outdoors. Through a small hallway you will find the master bedroom, with a queen bed and private half bath. The second floor houses the two additional bedrooms. One contains a double bed and futon, while the other houses two singles, and a futon. Plenty of space for the whole family. The exterior door off the kitchen leads out to a spacious deck, and a fenced-in yard, perfect for your furry family member! A short walk down the quiet street, leads to the community park, swimming beach, and a private boat dock for guests' use. Located just minutes from Interstate 390, 'Our Conesus Lake House' is convenient to Rochester, Buffalo, and many area attractions.